I wanted to check whether the choice of baseline can affect the calculation of global temperature anomalies from station data. Each temperature index (GISS, Berkeley, CRU) uses different normalisation periods for calculating weather station temperature anomalies. I was surprised to discover that this choice makes no difference whatsoever to the results. 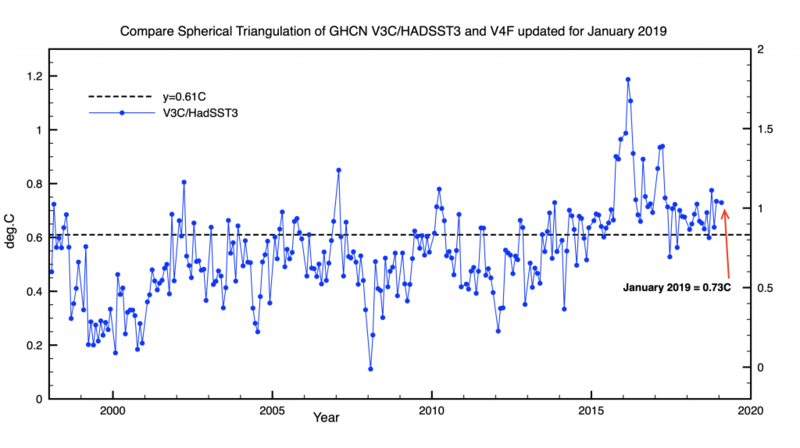 I used the new GHCN V4 which contains 27315 weather stations, and calculated the global average temperature anomaly relative to 5 different 30-year baseline periods using Spherical triangulation. Selecting different baselines restricts the analysis to those stations with sufficient data falling within those periods. Here are the results. 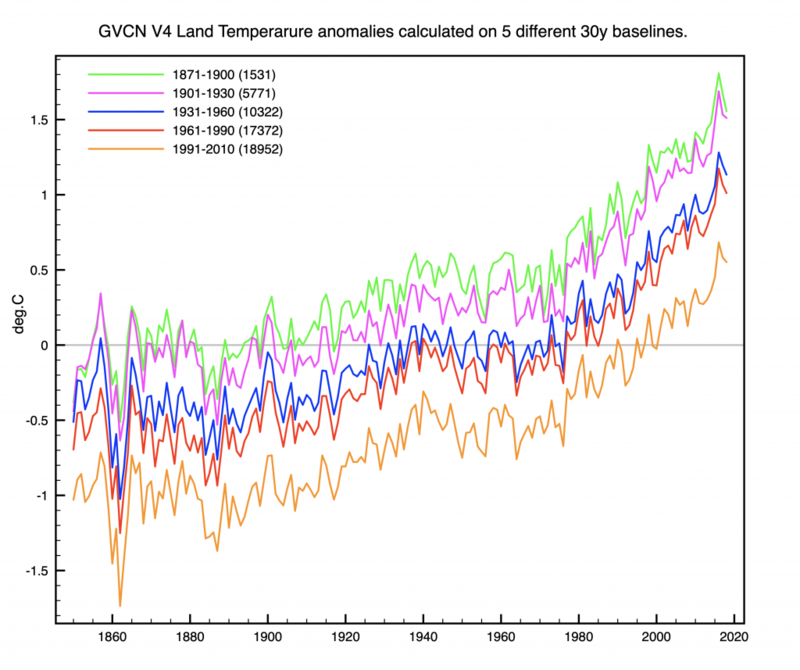 Global Land temperature anomalies calculated relative to 5 different baselines. 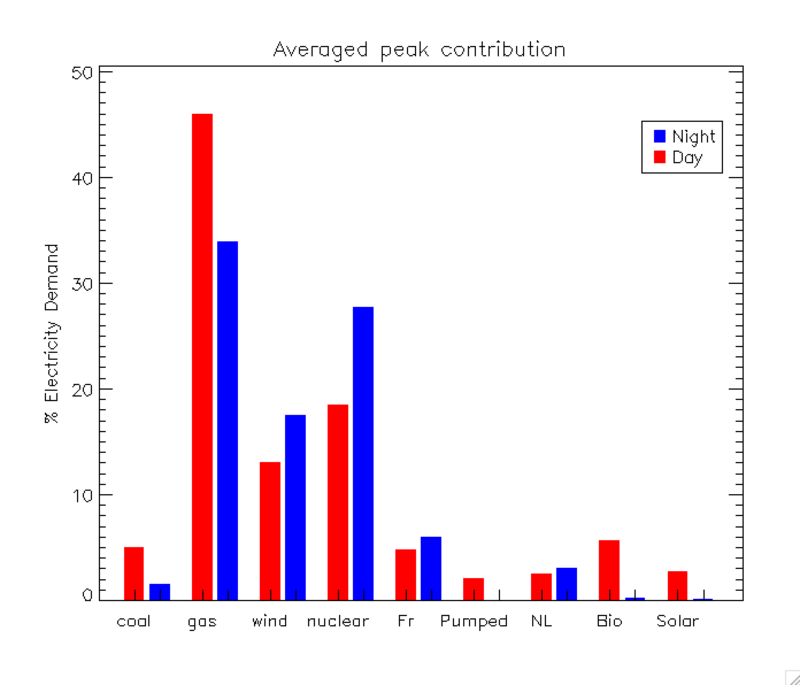 The numbers in brackets are the number of stations contributing for each baseline period. 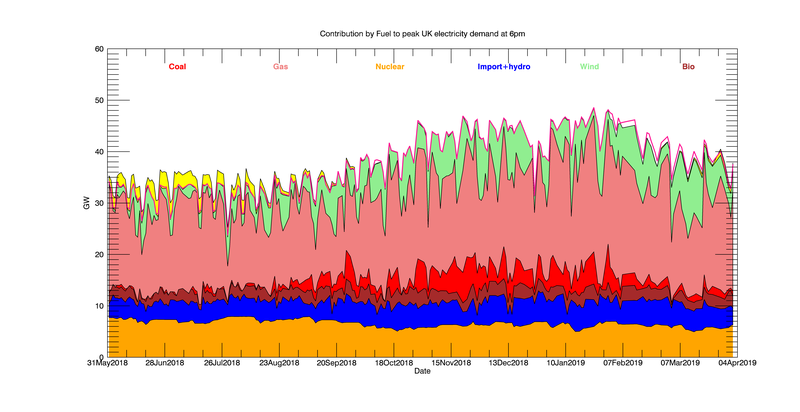 All the trends are very similar despite a factor of up to 8 difference in the number of stations used. We can compare them all directly by offsetting each onto the same 1961-1990 baseline. To do this I simply scale each one by the offset difference between 1961-1990 (shown in ‘calc’ brackets). 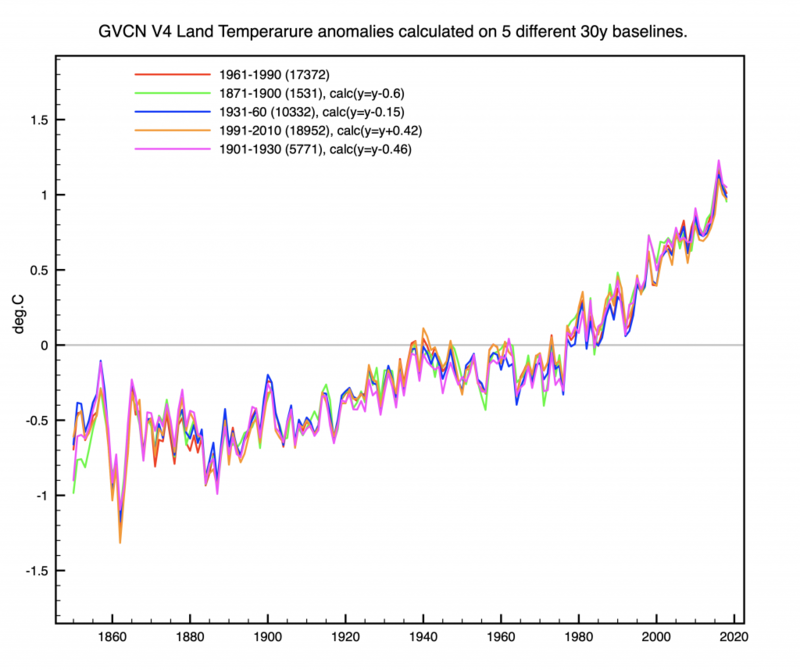 All 5 baselines offset to the same 1961-1990 normalisation. The offsets are shown as Calc. The results are surprisingly similar. This means that the choice of baseline period is essentially arbitrary and does not affect the end result. 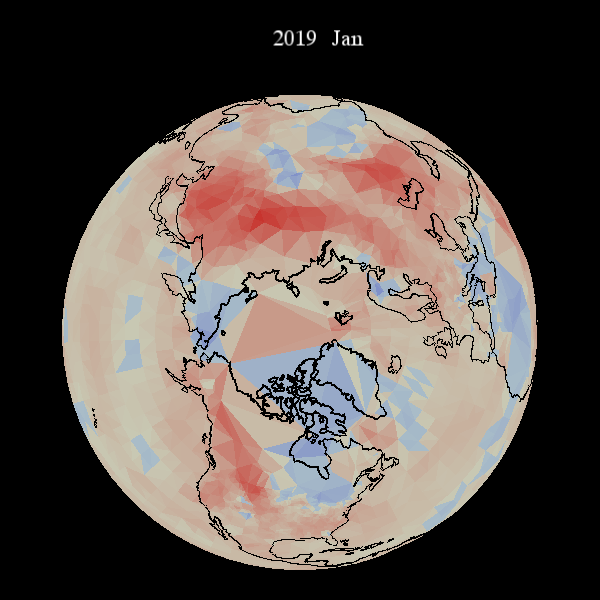 Global averaged surface temperature for January 2019 was 0.73C using my spherical triangulation method merging GHCNV3 with HadSST3. This is unchanged since December 2018. The baseline used is always 1961-1990. The Northern Hemisphere is shown here. Temperature distribution Northern Hemisphere. Siberia is warmer than December while N.America is cooler. and here is the Southern Hemisphere. 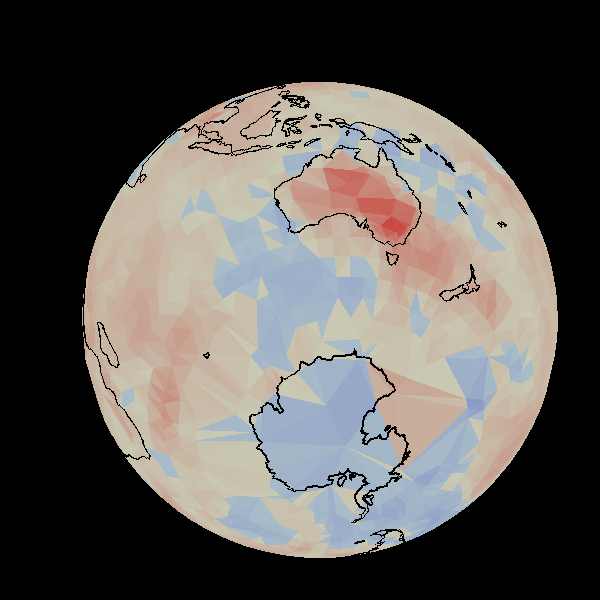 Souther Hemisphere shows high Australia temperatures while Antarctica is actually colder than normal.